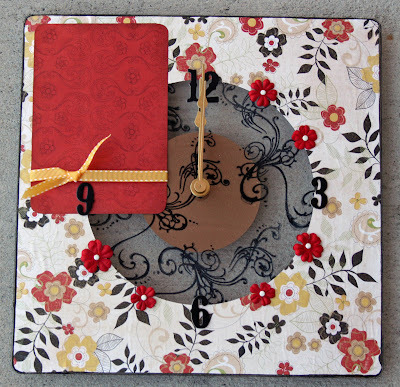 ... why not give the gift of a handmade clock? I have spent the past couple of days working on these, and hopefully my husband's family will not see this blog anytime soon, but I just couldn't resist showing these off! I love them! I took 12 x 12 acrylic panels and used my Crop-a-dile Big Bite to punch holes in the center of the panels. The clock mechanisms are available at JoAnn's, Michaels and Hobby Lobby ... I know this because I went to each store with my 40 percent off coupon to get them. They are regularly priced between $6.99 and $9.99. 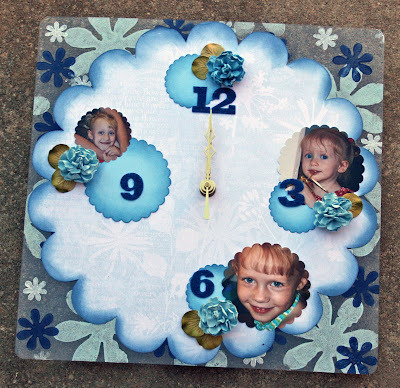 Aunt Sam's clock features photos of her three granddaughters, and her favorite color is blue, so I went with a blue floral theme. I used acrylic paint dabbers and foam stamps to stamp flower images on the front of the acrylic panel. I dabbed Stickles on some of the flowers and then used Distress Ink on the scalloped-edge paper to give it dimension. To protect the acrylic, I peeled the blue protective film off one side of the acrylic, the one I was working on, so the back side remained unscratched when I worked on it. Be sure to peel the blue film off the second side before you attach the clock mechanism. Aunt Vicky loves pink and I just love this photo of her and Uncle Earl dancing at a wedding last summer. I thought this clock would be just the thing to display it. I, again, used my favorite flourish stamp, but with white opaque Staz-On ink this time, and then just dotted Star Dust Stickles where the flourish design was dotted. 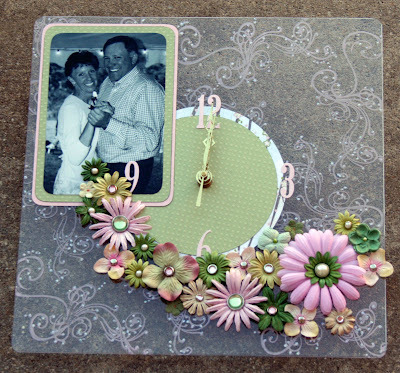 Prima flowers and a variety of bling brads helped with the romantic motif. When punching or drilling the hole for the clock mechanism, you will need either a 3.8-inch drill bit (be careful!) or the Crop-a-dile Big Bite, with the 6-inch reach. Since the Big Bite's punch is not a large enough circle, make several punches very close together, almost shaving away the edges slowly. Keep testing the mechanism in the hole you've made because you don't want the hole to be too big, so the mechanism itself spins in the hole. Of course, smaller panels can be used and smaller mechanisms are available. So, let your imagination run wild! we went and ate. Afterwards we headed out to do a little Christmas and birthday shopping (needed to find those skates for the skating party the next day!) We found roller skates for me - and for Will and Rodney, too! 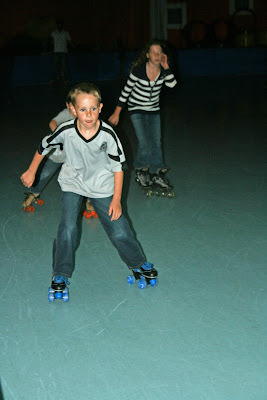 We all enjoy skating (some of us more than others, but said others realize this is good, active family time) and the skates and the roller rink are just awful, uncomfortable, the wheels would lock up, etc. So, on Sunday afternoon, we were all smooth sailing around the rink, including Xan who sported Will's old Fisher-Price in-line skates. They have three roller settings, locking up fewer wheels the better you get, and Xan made it up to the second setting, even skating away from the wall on his own a few times. Will got the hang of his roller skates in no time. Rodney likes his skates, although he said they were faster than we he would like. At least we found some that were big enough for his huge feet! 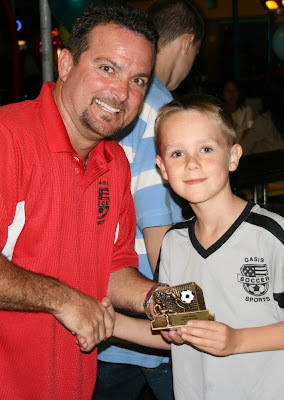 Will got his trophy from his coach and all the kids seemed pretty proud of their season (they still don't keep score at this level), as they should be. Now, back to work tomorrow, to get some plugging away done before I gorge myself on turkey! 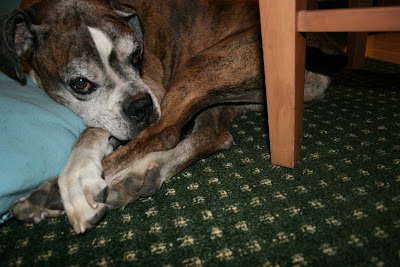 My first "son," Slade passed over the Rainbow Bridge today. His physical heart just couldn't keep up with his emotional one anymore. Thank you for 11 wonderful years, my protective, popcorn-loving, cat-chasing, talkative, tongue-bathing Slader-Pie. I'll miss you, baby. New Items and SALE at K2R! Well, it’s my birthday week … Saturday the 22nd is the big day … so I want to give all of YOU a gift! The Krew will have their five different project collections up on their blog the first week of Decemeber, so get your Krew Kit now so you're ready when inspiration strikes! 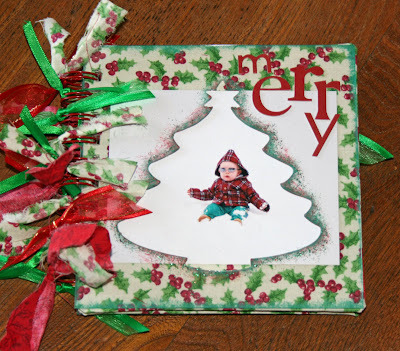 Ragtime Tree and Gingerbread 6 x 6 albums – Take a look at these affordable projects that are a fabulous mix of acrylic, chipboard and fabric! 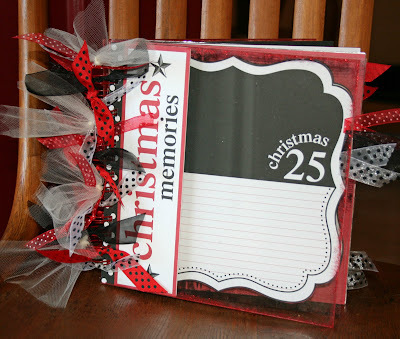 Christmas Memories 8 x 8 Acrylic album – If you loved last month’s 8 x 8 Halloween album featuring Teresa Collins’ paper line, you won’t want to miss this project kit! 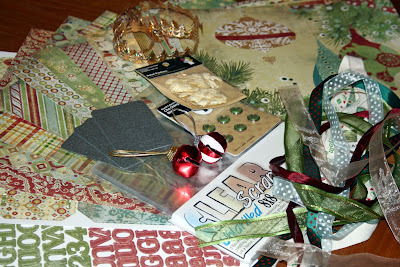 The Ragtime and Christmas Memories Kits come with full-color instructions available online with a code insdie the kit. 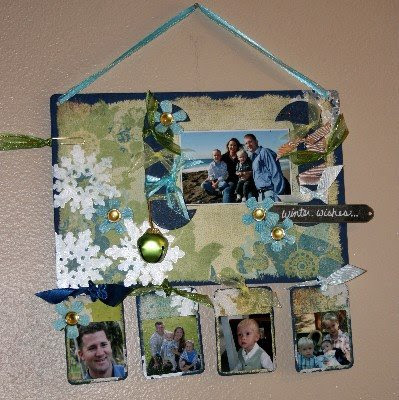 They are each designed be affordable, fast and easy projects, perfect for holiday gifts! But they'll be tough to give away! Live near Tampa, Florida? I am looking for a couple more volunteers to help me out at the Scrapbook Expo the first week of December. If you are interested, please email me at Jessica@kits2remember.com for details. Have you visited the K2R Design Krew’s blog lately? They are working hard to inspire you almost daily… be sure to check it out of you haven’t yet! Got questions? Our Krew is accessible via the Kits2Remember message board - just click on the message board link on the Kits2Remember home page and ask away! And as always, thank you for your business and support! 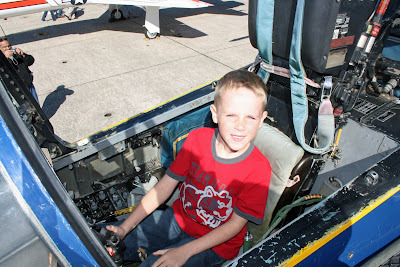 Will, Xan and I went to the annual Blue Angel Homecoming Air Show today. 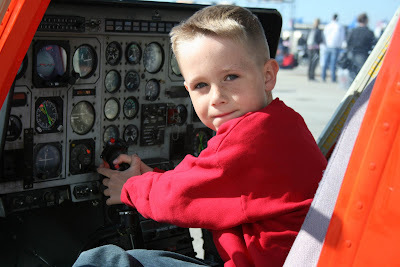 We had a great time checking out the static aircraft displays and watching the different planes do their tricks in the sky. 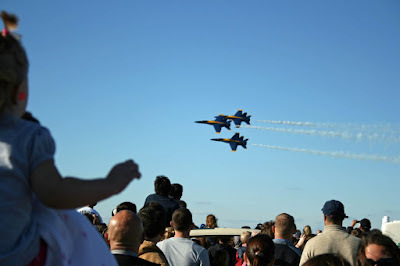 Of course, the big part of the show was the Blue Angels, who are based here in Pensacola. They have been a team since 1946 and were first based in Jacksonville, FL. 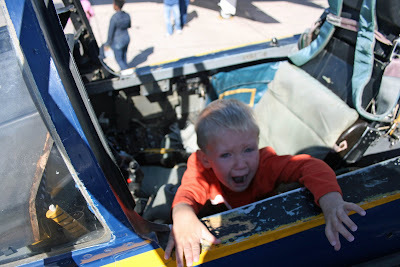 One of the first things we did was stand in line for half an hour to sit in the cockpit of a Blue Angel FA-18 Hornet. 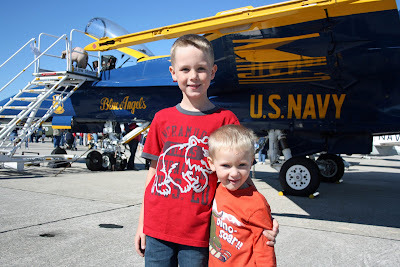 While this one does not have an actual engine in it, it is the same aircraft that the Blue Angels currently fly and have for 21 years. While Will did the expected paparazzi Mom smile for me, Xan wanted no part of the cockpit. 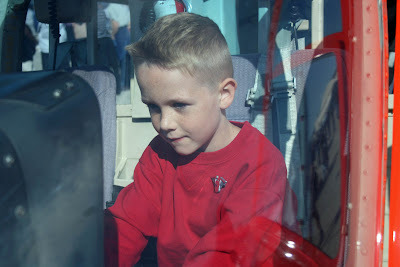 Will really wanted to sit in this small Marine Corps helicopter, so here he is "flying" it very seriously of course, because flying is a very serious task, and then the pilot poster shot. We waited in line for another half hour for lunch - hamburgers and fries. 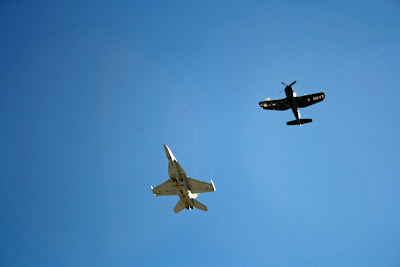 We watched some more planes perform - this is a performance display of new and old aircraft. 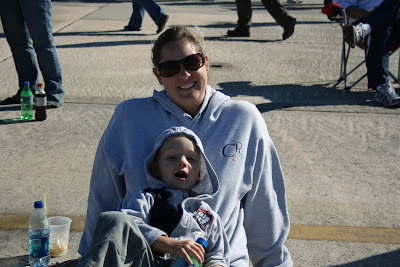 Will got this photo of Xan and and while we waited for the Blue Angels to perform. While waiting, the wind got even more biting, so we headed off to walk around and look at some more heliocopters. 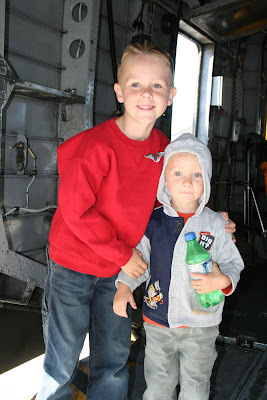 Here is a shot of the boys inside one. And then it was time for the big show. 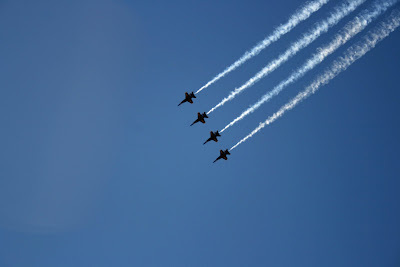 The Blue Angels did not disappoint and seemed to come from all angles to complete their fabulous stunts. Well, I have been busy designing projects for all sorts of things! 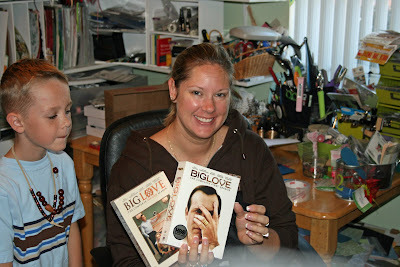 I have submitted two projects to Scrapbook Expo for the 2009 shows. I have applied to exhibit and teach at all 10 of their shows next year. Keep your fingers crossed that I get accepted (or you can alway email them and tell them how great I am... LOL). As soon as I know if they have been accepted, I will post the class projects here so you can get a sneak peek! You can get more details about it here, but it features Basic Grey double-sided paper, Imaginisce embellishments and K2R metal panels... what's not to like? And at $14.00, it is definitely an affordable gift! 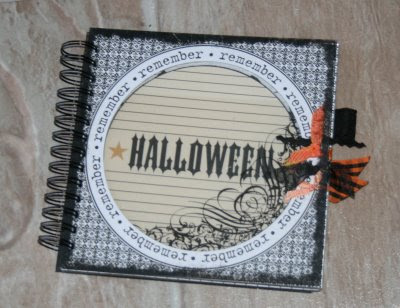 So, get yours now before I take them to the Tampa Scrapbook Expo in a few weeks! Kits2Remember is proud to announce that we will be taking part in Scrapbooking Roads' Reindeer Round Up Online Shop Hop next month. One (or more) of my customers told them they wanted K2R on the online shop hop, so I thought I would give it a shot. 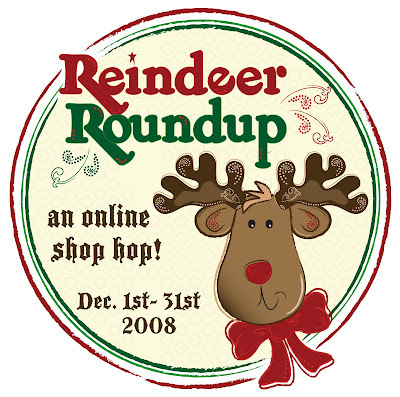 So, register on the Reindeer Roundup web page and watch for this cute logo for your chance for special offers, prizes and more. In fact, anyone who orders through the Reindeer Roundup Online Shop Hop Dec. 1-31 will get a reindeer acrylic embellishment... and that's just the start of the goodies from me! 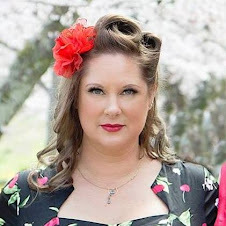 I had the pleasure of being a guest on the Diva Craft Lounge Internet radio show this week. So fun! Missed it? No worries, you can still listen to the archived show on their web site! I was on the show to help promote a new Diva design book. 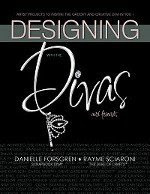 Want to design with the Divas? Diva Craft Lounge host Danielle and Rayme have published a new book with guest designers, featuring more than 50 different project ideas! Wow! And from the looks of the sneak peek they have on their web site, these aren't your average, everyday project ideas. 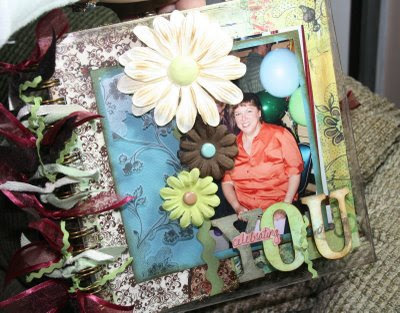 They run the gamut of paper crafting techniques AND come with step-by-step instructions so you can easily recreate these projects at home. All for $19.95! I am proud to say that I have an acrylic wall hanging called "CREATE" published in the book, which is due to hit shelves Dec. 12. You can pre-order your copy now in the K2R store. Definitely fun stuff and a great opportunity I appreciate! Plus, selected project kits are still 50 percent off, there are some good ones still left, and all Clear Scraps are 30 percent off through tomorrow. A great way to stock up on some holiday gifts ... or maybe an indulgence for yourself! On a personal note, can I just say how THRILLED I am that a scrapbook company is using one of my favorite (and least-known by the masses) animals in their new collection? 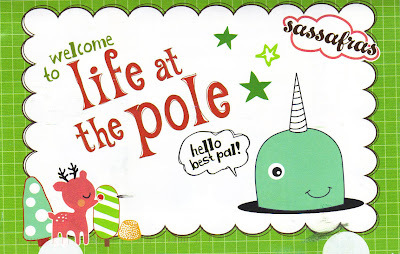 Sassafras has an adorable narwhal on their "Life at the Pole" collection and I LOVE that. The back story: Like many little girls, I was in to anything unicorn. I had figurines, stuffed animals, books, you name it. Then I found out that the legend of the unicorn is believed to have come from nomadic people seeing narwhals in the sea. Narwhals are porpoises whose males grown long, spiral tasks for figting during the breeding season, like antlers on deer. They only live in the Arctic, so they aren't well-known. Of course, as a elementary school student, you always have to do reports on animals. I chose the narwhal - a challenge since there was no Internet to be had at the time and it wasn't a very well-documented species - but, I became an expert and have always had a soft spot for these creatures of the sea. So, hooray for Sassafras ... can't wait to get my hands on some of that paper! Clear Scraps Albums on Sale, NEW Itty Bitties, Tampa Help and more! I hope you've had a chance to start your holiday gift and home decor projects. My chance will start as soon as I'm done writing this post! So, let's get to the news! 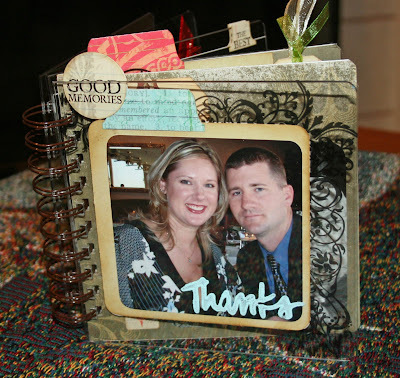 I am looking for some volunteers to assist me in my booth and classes at the Tampa Scrapbook Expo Dec. 5 and 6. Volunteers get free admission to the event the day(s) they work, a K2R T-shirt and some other goodies. If you are interested, please email me at jessica@kits2remember.com. All Clear Scraps shaped acrylic albums are 25 percent off for the rest of the week! This includes the original albums with the holes pre-drilled, and the UNdrilled albums , which allow you to punch or drill the holes where you want. These are great for unique gifts you can personalize. And don't forget to check out the NEW Clear Scraps Itty Bitty acrylic embellishments that make great album or page accessories! 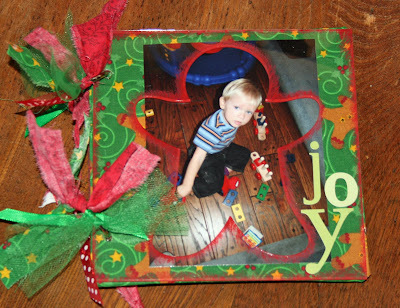 Looking for a great handmade album all finished and just ready for you to add photos to? I have some of my class samples up on Etsy right now. As always, thank you for your business and support! I appreciate it! ... well, I was uncharacteristically down for the count there for awhile, but thanks to a heavy dose of antibiotics and (finally) a couple good nights' sleep, I was back at work today! It turns out I managed to screw up a record number of orders in my fevered haze (sorry everyone!) but the stuff to fix the mistakes is on its way! Actually, it wasn't that many orders, but since I strive for great customer service, I hate to have anyone disappointed when they open their package. This week I plan to get to work on being more CREATIVE with my time by designing some new kits, classes and ideas for the site. I know the K2R Design Krew has been keeping the fresh ideas flowing for you guys on their blog, so I figured I better pull my own weight some time. So, stay tuned for those in the coming week. 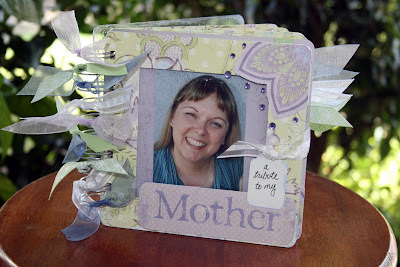 I have some new Clear Scraps shaped acrylic albums and some of acrylic embellishments. Those are always a lot of fun. The Krew will be creating some samples for you to check out soon. Anyhow, I will be back with more news soon. Until then, happy scrapping! Just wanted to post and let you guys know that I've been a bit slower about everything this week because I thought I had the flu. After a trip to the ER, it turns out it is a kidney infection and I should be feeling better by early next week, thanks to a shot of antibiotics and some interesting pain killers. Please bear with me for the next few days and I will be happy to address any questions or concerns you may have next week. Have you seen the RAK giveaway? The Krew has a posting RAK right now ... be sure to post for your chance to win! I have been struck by the flu, and I only feel OK when I am sitting still, and I'm sure you guys all know how much I love that! 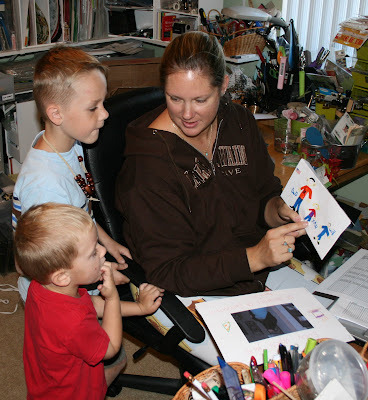 So, I am keeping busy with computer activities, downloading photos, uploading photos, organizing my web sites, etc. So, here are some random photos I just downloaded off my cameras. Enjoy! My scrap bud Carolyn gave this to me in Ontario. She used K2R metal pnaels (4 x 4) and strung them together with o-rings. She said it took her less than 5 minutes to create. I love fast projects! Carolyn also made one for a friend of hers that was undergoing surgery, as a token for encouragement. I have tried to take photos of this wall hanging to show how beautiful it is, but nothing is doing it justice. This is as good as it gets. But it is simply four of the 4 x 4 acrylic maple leaf frames, painted with paint dabber, stamped with StazOn ink and Stickled slightly. Fast and cute - a great hostess gift! 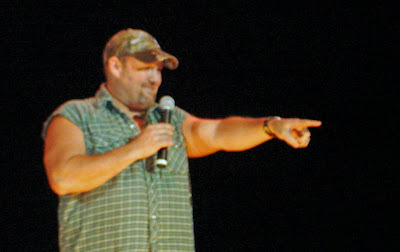 This past Sunday, Rodney and I went to the Larry the Cable Guy show at the Pensacola Civic Center. To coin a phrase I see on the backs of pickup truack all over Florabama - Git R Done! Who would think the beach would be enjoyable in November? We went to the beach on Sunday, and Xan did his usual screaming routine when we suggested he put his feet in the water, but this fit only lasted about 2 minutes. 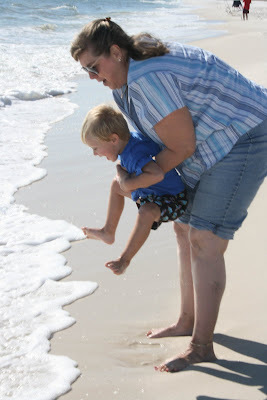 Then he was playing "jump the waves" with Grandma Nancy. Will was a little fish, as always. 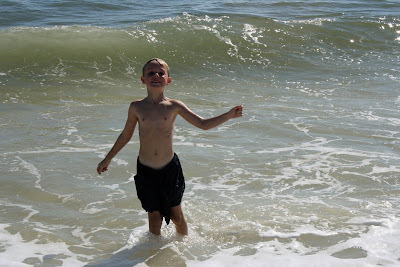 Actually, he was the only one in the water without a wet suit on - crazy child! And we let him pick out his own shorts. I think these are an old pair of Rodney's. 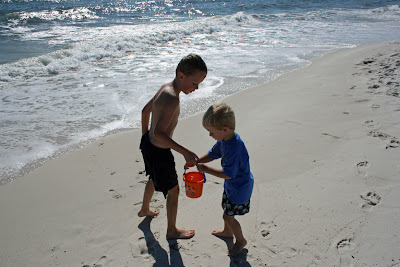 While Xan got brave dipping his toes in the water, he still wasn't ready to go get his own pail of water, so Will helped out. Slade is doing well. He's gotten skinny, but still enjoys eating, laying in the sun and stealing balls from the kids' play room, so he seems to still be enjoying life. 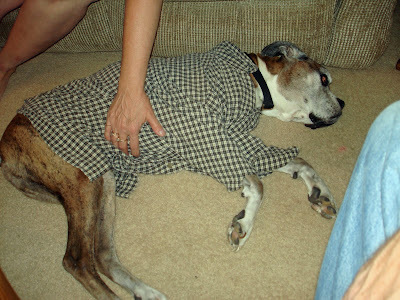 We just put a flannel shirt on him to keep him warm at night. Rodney and I spent two days aways from home, heading to Biloxi so Rodney could play some cards. 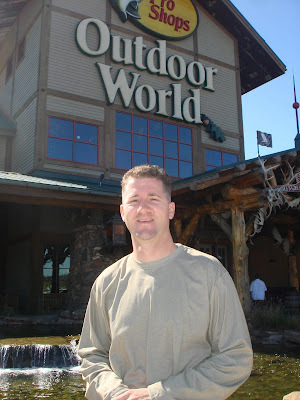 On he way back home, we stopped at the ultimate man store, the Bass Pro Shop Outdoor World. 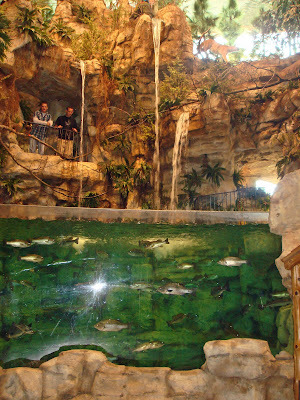 It reminded me a lot of a natural history museum with all the great wildlife displays. This is the waterfall and pond at the back of the shop. Despite all the camo and bows, I was still impressed and kept busy for about 45 minutes looking at everything while Rodney shopped for bow hunting gear. He is quite excited about going to Illinois next week to hunt. 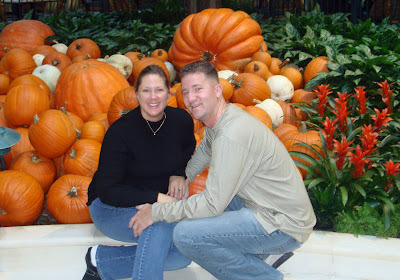 This is us in front of a pumpkin display the Biloxi's Beau Rivage hotel, where we gambled, had a couples massage and had a great steak dinner. and "Today Is..." interactive calendar are now available while supplies last. This is just a few of the projects for sale. Stop by the Etsy store to see them all!